The end of the year has certainly turned out to be an active one for data protection providers. This is a space in the industry that is always full of excitement and energy. Finding new and improved ways to protect production workloads is always an area that is filled with interest. NAKIVO is a company that keeps with an extremely aggressive pace for releasing new versions of their Backup & Replication Product and this has been a very exciting year for NAKIVO in terms of releases and functionality as well as in terms of industry awards and recognition. Early in November we covered the release of NAKIVO Backup & Replication 8.1 Beta which touted really great new features in terms of backup policy and policy driven data protection. This continued building upon the foundation of new features and functionality in Backup & Replication that have been released this year. As of yesterday, at the time of this writing, with NAKIVO Backup and Replication v8.1 released GA with new features including this policy based data protection, NAKIVO has capped off the year with great new functionality for their data protection solution. Let’s take a closer look at the new features contained in the v8.1 GA release as well as review the milestones that NAKIVO Backup & Replication has made throughout the 2018 year. The primary new functionality contained in NAKIVO Backup & Replication v8.1 GA is the ability to create data protection solutions based on policy. Data protection by policy is a huge deal because it allows protecting business-critical workloads based on a desired state if you will which falls in line with the mindset of automation today. Basically, the NAKIVO Backup and Replication v8.1 GA policy-based data protection allows administrators to define the state of what they want to see included in their backups and the NAKIVO policy-based data protection functionality will do the rest by automatically adding virtual machines that are defined by what the data protection policy looks like. This allows for many advantages over “micro managing” data protection jobs. As you can imagine it takes a tremendous amount of effort off the shoulders of backup administrators having to continually monitor and edit jobs to include or delete virtual machines contained in those backups. This allows for many advantages for the backup administrator. Automated approach – To drive this point home, this helps to ensure an automated approach. Once again, it keeps administrators from having to micro manage the backup jobs to ensure that all VMs are contained that need to be or remove VMs that are no longer needed. Efficiency – Time is better spent on other tasks than having to spend time editing backup jobs. Automation is key when dealing with the mundane tasks associated with infrastructure. By using policy-based management of these critical infrastructure tasks, time is much better spent and efficiency is greatly improved. Helps to avoid inadvertently missing VMs in data protection – It happens often that VMs that were believed to be backed up are somehow missed. By using a policy-based approach, this type of human error is avoided. NAKIVO Backup & Replication v8.1 utilizes the policy-based approach to ensure that all VMs associated with or need to be associated with a particular data protection job are indeed contained there. Integrates nicely with VMware vSphere tags – Tags in vSphere are an extremely underutilized mechanism for associating useful metadata with a virtual machine. By using tags, administrators can create characteristics that can easily be queried by NAKIVO‘s policy-based management engine and used for policy-based data protection. To implement this new functionality, it only takes a few quick steps to have a policy defined that can be used to query and dynamically add virtual machines to the backup job for protection. To get started, click the Create button and choose the type of job you want to create. 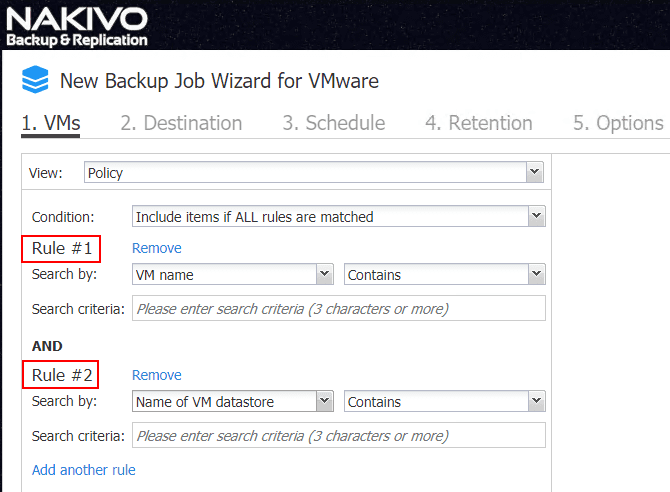 After choosing to create a new VMware vSphere backup job, the New Backup Job Wizard for VMware launches. To get to the Policy builder view, click the View drop down box. Choose Policy. This then allows creating Rules based on defined criteria. The rules creator allows defining the Search by field and the search logic to use in the rule. As you can see, there are a number of criteria that can be used to search on in the vSphere infrastructure. A look at the search logic. As you can see below, you can stack rules in the rules builder interface. 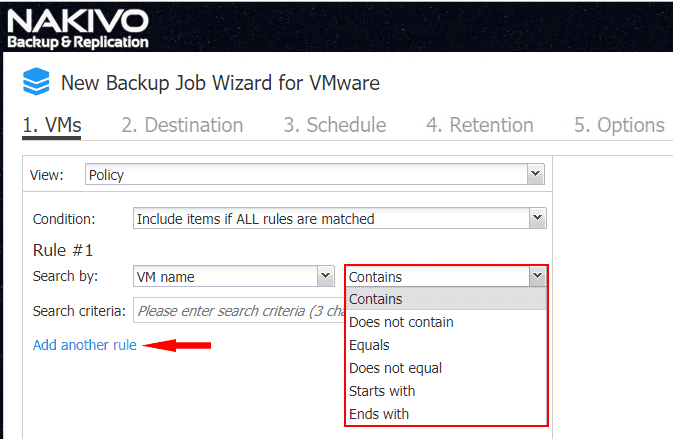 By using multiple rules, you can get very granular in the logic used to choose VMs to pull into the backup job. 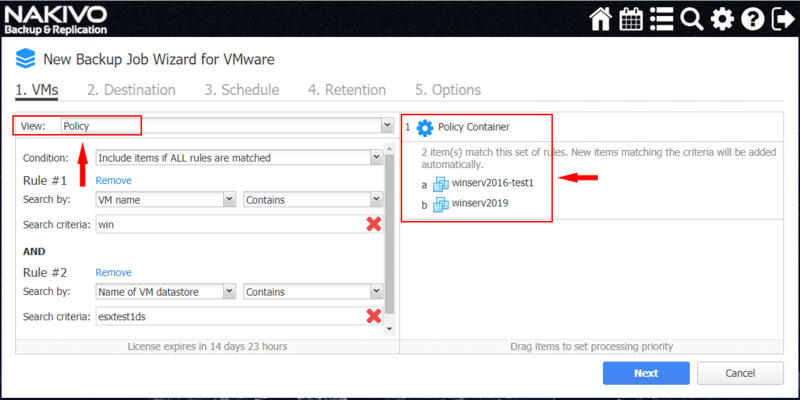 After building the policy, the Policy Container node will display the VMs that were found that match the criteria defined in the rules. It has been quite a year for NAKIVO in its release cadence. Many new releases have been shipped that have brought about great new features in the NAKIVO Backup & Replication product for customers. Let’s take a look at the releases contained in 2018 and the features that were added. NAKIVO Backup & Replication v7.3.1 (January 23, 2018) – While this was a bug fix release in January, it still introduced great features in the NAKIVO product line (officially released December 11, 2017). The new version provides support for the Synology NAS models featuring Appollolake and Broadwellnk CPU architecture. NAKIVO Backup & Replication v7.4 (April 25, 2018) – This was an absolutely huge release in terms of features and functionality contained! 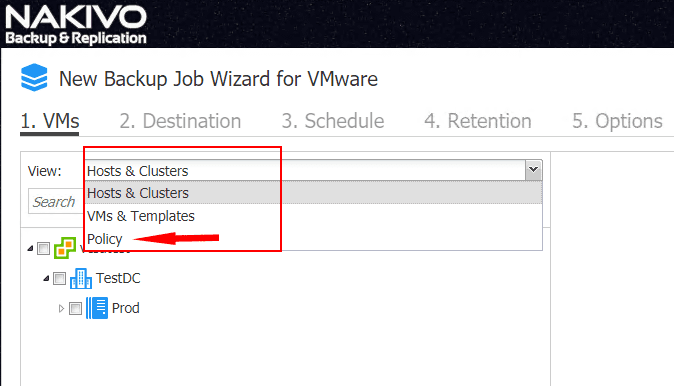 The new Failover job was created in this release which allows having a job ready on standby to switch over a VMware or Hyper-V virtual machine to an existing replica VM in a secondary location. This release also includes functionality to take care of automatic configuration of new IP addresses and virtual switch configuration to allow the virtual machines to align with the new network in the DR or secondary location. Support for Deployment on ARM-based NAS DevicesARM based NAS models are now supported with this release, and is capable of working with VMware vCenters and ESXi hosts. In this case, an additional Transporter needs to be added to the application in accordance with the instructions. File Recovery Back to SourceA great new feature in this release which allows recovering a file back to the source directly instead of having to download the file and perform a manual restore, or email the file to yourself before being able to restore to a server. The direct restore is certainly what most customers want to achieve when restoring files. Bandwidth ThrottlingWhen bandwidth is limited, having the ability to throttle traffic, including backup, replication, backup copy traffic is extremely important. Bandwidth throttling for replicas is limited to VMware and Hyper-V replication jobs. Now with this release, customers can throttle bandwidth for specific jobs to use only the configured amount of maximum bandwidth. Flash VM Boot for Microsoft Hyper-VHyper-V virtual machines now have the ability to be able to utilize the flash boot process and boot directly from backup storage. The process is fully automated, and allows the user to migrate the booted Hyper-V VMs to the production environment. Screenshot Verification for Microsoft Hyper-VHyper-V VMs protected with NAKIVO can now take advantage of screenshot verification. The process test-recovers the VM first, takes a screenshot of the booted OS, and then discards the test-recovered VM. Self-BackupBacking up the configuration of the NAKIVO installation itself is important. 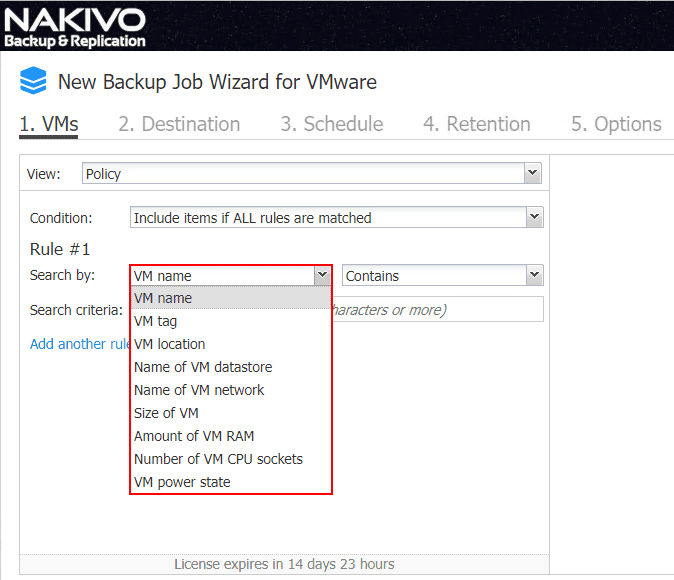 The new self-backup feature allows backing up the configuration of the NAKIVO environment. Global SearchThe Global Search allows finding infrastructure objects, seeing object details, and performing object tasks individually and in bulk. Built-In Support ChatBuilt-in chat support right from within the NAKIVO console. In this release, support for VMware vSphere 6.7 was added which was the newest release of VMware vSphere at the time. EMC Data Domain Boost SupportThe new version of NAKIVO Backup & Replication officially integrates with the BoostFS plugin, allowing to combine benefits of the VM backup software and source-side deduplication offered by Dell EMC Data Domain Boost. As a result of this integration, the VM backup size can be reduced by up to 17 times while the VM backup speed can be improved by up to 50%. Install on NETGEAR ReadyNASNAKIVO Backup & Replication with this release can now be installed directly on Netgear ReadyNAS devices, which helps create a cost-effective VM backup appliance. The ReadyNAS-based appliance is a 5-in-1 solution featuring backup hardware, software, storage, built-in global data deduplication, and backup-to-cloud functionality. Cross-Platform RecoveryNAKIVO Backup & Replication offers a new functionality for cross-platform VM data recovery. With the Cross-Platform Recovery feature, users can export VM data from VMware, Hyper-V, and AWS EC2 backups into VMDK, VHD, or VHDX formats. The exported files can then be used for recovery across different hypervisors, cross-platform VM data migration, long-term archival, or sandboxed testing. Advanced Bandwidth ThrottlingThe updated Bandwidth Throttling feature provides for setting speed limits for data protection to avoid network overload during business hours or chosen periods of time. The process can be easily automated by means of setting global rules that maintain bandwidth consumption at certain levels when needed the most. 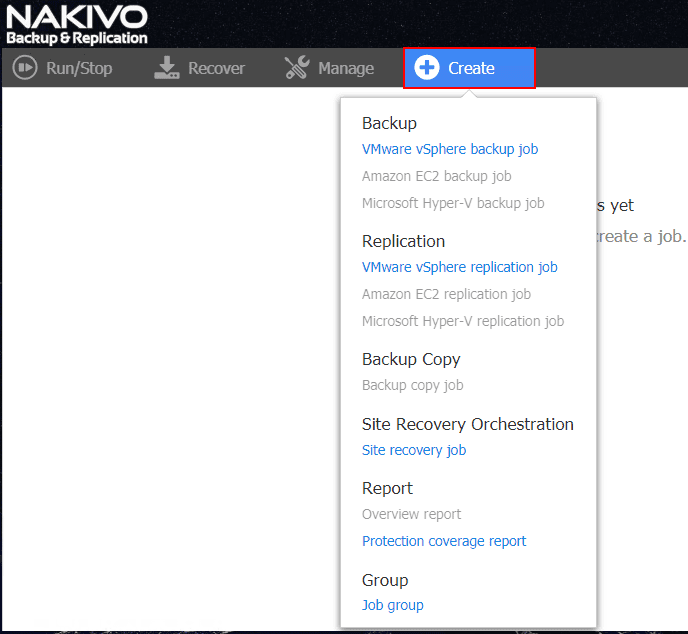 NAKIVO Backup & Replication v8.0 continued down the path of greatly improving the overall disaster recovery process by introducing site recovery which allows creating an automated and orchestrated job that can be fully tested and failovers simulated manually or on a set schedule. As we have covered in this post, policy-based data protection is a powerful way that NAKIVO has continued working on the fully automated and orchestrated solution from a DR perspective. This allows efficiently adding or removing VM objects dynamically to data protection jobs. NAKIVO Backup & Replication v8.1 adds further versatility by introducing Universal Object Recovery. Whenever important application data gets deleted or modified, you can mount VM disks from a backup to your VM and use native application management tools to recover the data to your production database. NAKIVO Backup and Replication v8.1 GA released with new features including the policy-based data protection jobs allows organizations to have an even more powerful way to protect their enterprise environment, business-critical workloads. This can be accomplished in an automated and declarative way through the defined policies. NAKIVO has had a great year of releases in terms of features and functionality contained within the releases for 2018 and they certainly improved functionality on the DR automation side of things as well as orchestrating these very complex processes in an easy way right from within the NAKIVO Backup & Replication console. Download the trial version here.